Now, here is an actress who actually had a career in Tinsel Town, playing leads and supports in movies that were not blockbusters nor works of art, but still were bread and butter to thousands actors, actresses, directors and other Hollywood personnel. Katherine Harris was born to James Harris and Agnes Mahurin on August 18, 1919, in Elkhorn, Wisconsin. She was the second child – her siblings were John (older brother), James (born April 15, 1924) and Martha (born April 21, 1929). Her father was the vice-president of Milk Products Co, so the family was well off and employed a maid, Josephine. Katherine attended Elkhorn high school and graduated in 1937. She moved into the amateur theatrics arena by doing summer stock for two seasons. After a year at Milwaukee Downer and another at Carlton college in Minnesota, she did bit work with the Belfry Players and the Grand Detour. In 1940, Kay was getting ready to enroll into University of Wisconsin, when her aunt, Marsha Wheeler, a member of the staff at the Station WSAI in Cincinnati, offered Kay a position as her personal secretary. Kay accepted and wired her parents to cancel her dormitory room and she moved to Cincinnati to start working. Kay was by pure coincidence – Penny Singleton, the actress playing in the Blondie series, was vacationing there with her husband, producer-director Robert Sparks, and they were giving a joint appearance at the radio station Kay worked in. Penny noticed the pretty girl, and persuaded her husband to test her for the role of Tillie the Toiler, another popular comic book series heroine, previously played by Marion Davies. Kay took the plunge, bough a round trip to Los Angeles, asked for a two week leave from work, and departed. She tested for Tillie, and got the role which catapulted her towards a Columbia contract. Kay had a much better career than most starlets on this site. 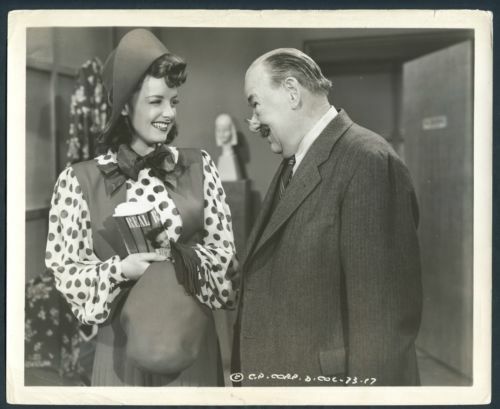 No, she was not in the big league with Barbara Stanwyck and Claudette Colbert, nor was she ever a well known B actress like Marguerite Chapman, but she worked regularly from 1941-1943 and did a few decent movies with strong roles – thus, no uncredited and -blink-and-you’ll-miss-me roles. Kay’s first movie was a lead in Tillie the Tolier. Sadly the movie is both forgotten today and hard to find, almost a collector’s item, but back in 1941, the plot and Kay were critically applauded. Based on a famous comic, Kay plays the eponymous Tillie, an adorable but clumsy girl who almost shipwrecks a business, only to single-handedly rise it from the ashes into a triumphant success. Kay made a big return to Elkhorn, where the world premiere of the film was help to great fanfare and newspaper interest. After spending the summer there, it was back to Hollywood for more legwork. The rest of her career was undistinguished but solid. Her next was Parachute Nurse, a woman empowerment movie typical for the WW2 period with the ever reliable Marguerite Chapman in the lead. Kay has an interesting role of a fellow parachute nurse. 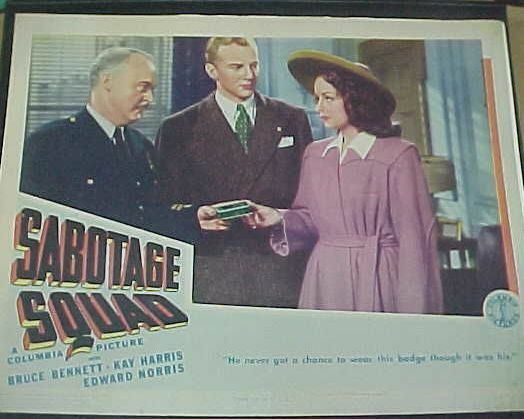 The string of WW2 themed movie continued in Sabotage Squad, a anti-Nazi spy movie with the muscleman Bruce Bennett – and Kay was once again the leading lady. 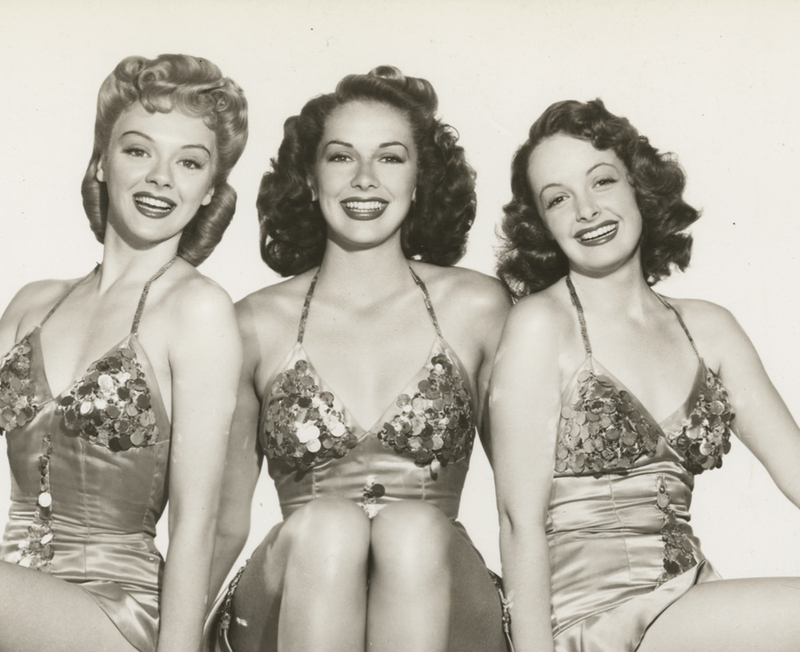 Lucky Legs put her in a female troika with Leslie Brooks and Jinx Falkenburg, both stunningly beautiful and better known actresses. The movie is very obscure today. Her next movie is easily her worst, The Spirit of Stanford – a badly made, amateur drama about about college life. Frankie Albert plays a over-the-top, infinitely annoying I-am-better-than-you college grad who miraculously changes his ways for a woman. Been there a thousand times, seen better. After this, Kay was in a similar football/college movie, Smith of Minnesota – and then hit rock bottom by being a low class western leading lady in Robin Hood of the Range and The Fighting Buckaroo. Better than uncredited fare, it still signaled a downward spiral for her that ended as it usually did for actresses in the 1940s – by retirement. On a high note, Kay ended her film career by choice and not by necessity, as she still was a leading lady, no matter what type of movies she made, and could have pushed for at least several more years, especially during the war when actors were scarce and actresses were expected to take a large burden of the movie making process. Kay started dating right of the bat in Hollywood. Her first admirer was Jack Clark, manager of the Plaza Hotel, in March 1941. Already in April she turned the head of Ken Murray, famous impresario. he gave her a welcome party to Hollywood and introduced her to a large number of film people. She broke his heart by leaving him for Cliff Edwards, another admirer. Kay married her first husband, Henry Freulich, a cameraman, in January 1942. He was born in 1906 in New York and worked in Hollywood since 1930s. Already in January 1943,she was on the way to Reno for a divorce. Freudlich went on to become a noted cinematographer. He married Adele N. Roy in 1961. He died in 1985. 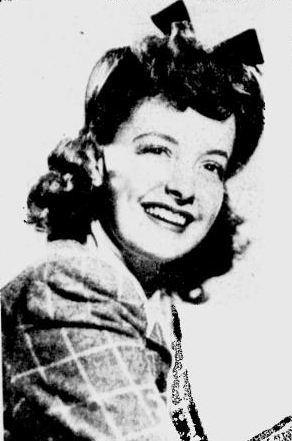 Kay left Hollywood in 1943, and as a result, her newspaper output was severely diminished, and I could not find any further information about her life. She married Cyrus Bennett and had a son, Marshall. Kay Harris Bennett died on October 23, 1971, in Ventura, California. I just wanted to let you know that she did die in California, after she left Hollywood her life was troubled however she did remarry to Cyrus Bennett and had one son Marshall Bennett. I know this because she is my grandmother. And I also wanted to say thank you for this blog. Why thank you for the info! If you have any more information to share, please do! I could be wrong but I think Kay Harris joined the American Red Cross Clubmobile Division during WWII. In the records of the ARC there is a woman named Katherine Harris, born in Elkhorn, Wisc; August,18, 1919. She was assigned to the Group G. Maybe a coincidence, but …. After service in Europe she returned to the USA on August, 16, 1945. She is registered as “Kay M Harris” in the passengers list of the U.S.A.H.S. “Frances Y. Slanger” sailing form Cherbourg, France. Unfortunately, I haven’t been able to find any picture of her on service so this theory is not 100% confirmed. By the way, there is another Clubmobiler in your blog, Whitney Bourne, she was assigned to the Group B.
Hi Fano! Thanks for the interesting information!